^ Schafer-Lichtenberger (1 September 1996). "Sociological views". In Volkmar Fritz (ed.). The Origins of the Ancient Israelite States. Philip R. Davies. Bloomsbury Publishing. ISBN 978-0-567-60296-1. ^ Sch��lch 1993, pp. 161–62. Albright, W.F. (2000) . "The Amarna letters from Palestine". In Eiddon, Iorwerth; Edwards, Stephen; Gadd, C. J. (eds.). Cambridge Ancient History: The Middle East and Aegean Region c. 1380–1000 BC. 2 (3 ed.). Cambridge University Press. pp. 98–116. ISBN 978-0-521-08691-2. Retrieved October 29, 2012. Al-Muqaddasi (2001). Collins, B. A. (ed.). The Best Divisions for Knowledge of the Regions. Ahasan al-Taqasim Fi Ma'rifat al-Aqalim. Reading: Garnet Publishing. ISBN 978-1-85964-136-1. Retrieved 26 July 2011. Barnay, Jacob (1992). Goldblum, Naomi (ed.). The Jews in Palestine in the Eighteenth Century: Under the Patronage of the Istanbul Committee of Officials for Palestine. University of Alabama Press. ISBN 978-0-817-30572-7. Retrieved 20 July 2011. Benjamin (of Tudela) (1907). Adler,, Marcus Nathan (ed.). The itinerary of Benjamin of Tudela: critical text, translation and commentary. Oxford: Henry Frowde. Bouckaert, Peter (2001). Bencomo, Clarissa (ed.). Center of the Storm: A Case Study of Human Rights Abuses in Hebron District. Human Rights Watch. ISBN 978-1-56432-260-9. Retrieved 26 July 2011. Campos, Michelle (2007). "Remembering Jewish-Arab Contact and Conflict". In Sufian,, Sandra Marlene; LeVine, M. (eds.). Reapproaching borders: new perspectives on the study of Israel-Palestine. Rowman & Littlefield. pp. 41–66. ISBN 978-0-7425-4639-4. Cazelles, Henri (1981). "Chābhar". In Botterweck, G.J. ; Ringgren, H.; Fabry, H.-J. (eds.). Theological dictionary of the Old Testament. 4. Wm. B. Eerdmans Publishing. pp. 193–197. ISBN 978-0-8028-2328-1. Retrieved July 26, 2011. Cohen, Hillel (2009) . Watzman, Haim (ed.). Army of Shadows: Palestinian Collaboration with Zionism, 1917–1948. University of California Press. ISBN 978-1-55054-967-6. Retrieved 25 July 2011. Dumper, Michael (2003). "Hebron". In Dumper, Michael; Stanley, Bruce E. (eds.). Cities of the Middle East and North Africa: a historical encyclopedia. ABC-CLIO. pp. 164–67. ISBN 978-1-57607-919-5. Retrieved July 26, 2011. Emmett, Chad F. (2000). "Sharing Sacred Space in the Holy Land". In Murphy, Alexander B.; Johnson, Douglas L.; Haarmann, Viola (eds.). Cultural encounters with the environment: enduring and evolving geographic themes. Rowman & Littlefield. pp. 261–82. ISBN 978-0-7425-0106-5. Falah, Ghazi (1985). "Recent Colonization in Hebron". In Newman, David (ed.). 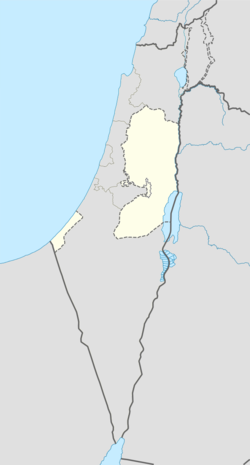 The Impact of Gush Emunim: politics and settlement in the West Bank. London: Croom Helm. pp. 245–61. ISBN 978-0-7099-1821-9. Flavius Josephus (1860) . Whiston, William (ed.). The complete works of Flavius Josephus. London: T. Nelson and sons, 1860. Retrieved 26 July 2011. Gil, M. (1997). Broido, Ethel (ed.). A history of Palestine, 634–1099. Cambridge University Press. ISBN 978-0-521-59984-9. Retrieved 25 July 2011. Glick, Leonard B. (1994). "Religion and Genocide". In Charney, Israel W. (ed.). The Widening Circle of Genocide. Genocide: A Critical Bibliography. 3. TRansaction Publishers/Institute on the Holocaust and Genocide. pp. 43–74. ISBN 978-1-412-83965-5. Retrieved January 20, 2010. Graetz, H. (1895). Löwy, Bella (ed.). The History of the Jews:From the Chmielnicki Persecution of the Jews in Poland (1648 CE) to the Period of Emancipation in Central Europe (c. 1870 CE). History of the Jews. 5. Jewish Publication Society of America. Retrieved 27 July 2011. Hezser, Catherine (2002). "The Social Status of Slaves in the Talmud Yerushalmi and in Graeco-Roman Society". In Schäfer, Peter (ed.). The Talmud Yerushalmi and Graece-Roman Culture. Texte und Studien zum antiken Judentum. 3. Mohr Siebeck. pp. 91–138. ISBN 978-0-567-02242-4. Retrieved 26 July 2011. Kraemer, Joel L (2001). "The Life of Moses Ben Maimon". In Fine, Lawrence (ed.). Judaism in Practice: From the Middle Ages Through the Early Modern Period. Princeton University Press. pp. 413–428. ISBN 978-0-691-05787-3. Retrieved 20 July 2011. Lemaire, A. (2006). "New Aramaic Ostraca from Idumea and their Historical Interpretation". In Lipschitz, Oded; Oeming, Manfred (eds.). Judah and the Judeans in the Persian Period. Eisenbrauns. pp. 413–456. ISBN 978-1-57506-104-7. Retrieved 7 October 2015. Levi della Vida, G. (1993) . "Tamīm al-Dārī". In Houtsma, M.T. ; Arnold, T.W. (eds.). E.J. Brill's first encyclopedia of Islam, 1913–1936. VIII. BRILL. pp. 646–648. ISBN 978-90-04-09796-4. Magen, Yitzakh (2007). "The Dating of the First Phase of the Samaritan Temple on Mt Gerizim in Light of Archaeological Evidence". In Lipschitz, Oded; Knoppers, Gary N.; Albertz, Rainer (eds.). Judah and the Judeans in the Fourth Century BCE. Eisenbrauns. pp. 157–212. ISBN 978-1-575-06130-6. Micheau, Françoise (2006). "Eastern Christianities (eleventh to fourteenth century): Copts, Melkites, Nestorians and Jacobites". In Angold, Michael (ed.). Eastern Christianity. The Cambridge History of Christianity. 5. Cambridge University Press. pp. 373–403. ISBN 978-0-521-81113-2. Retrieved 20 July 2011. Moudjir ed-dyn (1876). Sauvaire (ed.). Histoire de Jérusalem et d'Hébron depuis Abraham jusqu'à la fin du XVe siècle de J.-C. : fragments de la Chronique de Moudjir-ed-dyn. Mulder, M.J. (2004). "Qirya". In Botterweck, G. Johannes; Ringgren, Helmer; Fabry, Heinz-Josef (eds.). Theological dictionary of the Old Testament. 13. Wm. B. Eerdmans Publishing. pp. 164–167. ISBN 0-8028-2337-8. Retrieved July 26, 2011. Salaville, Sévérien (1910). "Hebron". In Herbermann, C.G. ; Pace, E.A. ; Pallen, C.B. ; Shahan, T.J.; Wynne, John Joseph; MacErlean, Andrew Alphonsus (eds.). The Catholic encyclopedia: an international work of reference on the constitution, doctrine, discipline, and history of the Catholic church. 7. Robert Appleton company. pp. 184–186. Schwarz, Yehoseph (1850). Leeser, Isaac (ed.). A Descriptive Geography and Brief Historical Sketch of Palestine. A. Hart. Retrieved 26 July 2011. Sharon, M. (2003). "Palestine Under the Mameluks and the Ottoman Empire (1291–1918)". In Avi-Yonah, Michael (ed.). A History of Israel and the Holy Land. Continuum International Publishing Group. pp. 272–322. ISBN 978-0-8264-1526-4. Retrieved 20 July 2011. Smith, W.R. (1963) . Cook, Stanley A. (ed.). Kinship and Marriage in Early Arabia. Boston: Beacon Press reprint. ISBN 978-0-8264-1526-4. Retrieved 20 July 2011.